In early 2002, I was a member of the King Arthur Baking Circle, a message board for baking enthusiasts. With this brand new interest in sourdough, I found myself reading all of the threads under that category. In March another member, Pat Doucette began posting of the difficulties she was having in getting a starter going. She had tried a few different recipes with no success. Now she was following the formula in The Bread Baker's Apprentice and... still no luck. Newly armed with all of the advice that she was getting from others on the forum, she started over. And once again, she got results that were nothing like the book describes. But a pattern was becoming clear. On the second day, her seed cultures would fill with bubbles and expand to over three times the starting volume when minimal growth was expected. And then do nothing on the third and fourth days when they were supposed to be expanding more and more. They came on strong and then died at the same point each time. A pattern holds a clue, so I offered to do the procedure myself and see if I could reproduce what she was seeing. I followed the directions to the letter and, lo and behold, my results duplicated Pat's perfectly. I may be the only person on the planet who would be excited about this, but it gave me something to study and troubleshoot. There was something unexpected going on at the microbial level. Living things are funny that way, and microorganisms don't always follow directions. One by one, other people on the message board began to speak up and post that they had experienced the same thing. In fact, it seemed that many more saw that scenario than the one described in the book. This phenomenon had nothing to do with local strains of lactobacilli and yeast as some had surmised, because Pat was making starter in Massachusetts and I was in Missouri. Others chiming in represented various regions of the country from coast to coast. This pattern is apparently quite common. We ran the gamut of theories on why yeast were coming on like gangbusters, only to quit and become non-responsive. We tested each theory by trying different flours at various points, increasing the feeding frequency, changing the hydration and water source, cooling it down, and anything else that anyone thought might help. But in the end, nothing fixed the problem, and the results weren't making much sense to me. At that point, I had to do what microbiologists do when things don't add up---go back to the microscope and take a look. That meant packing up my starters, taking them to work, and having to answer all the curious questions about what I was doing and why. But the microscope answered a few of my questions, and that day proved to be the turning point. No wonder things didn't make any sense! We were operating on the assumption that we were growing yeast. What I found was that there were no yeast or lactobacilli to be seen anywhere in all the activity of day two. Not a single one. But it was like a three-ring circus in there---different kinds of bacteria, some round, some rod-shaped, some motile, some not. Some were spinning, some were twirling, some flipping or zigzagging, and some were just darting back and forth across the field. What were these bacteria, and which one was responsible for all the gas? I knew, from having made so many starters by now, that this pattern does turn into sourdough if given more time. So, I looked at cultures each day in the process, comparing them to my established starter which was yeasty and stable. Everything quiets down in there and yeast emerges a few to several days later. They don't appear to be coming from the air as many people believe, because it happens even in a covered container. But if they are already in the flour as the more reliable sources say, then why couldn't I find any? Obviously, there was more to this than just a symbiotic relationship between lactobacilli and yeast gradually increasing in number, good guys out-competing bad---the usual explanation. It was evident that there are many more bacterial and fungal species present in flour than just sourdough lactobacilli and yeast. But where were the good guys? Why weren't they growing? It was time to close the cookbooks and open the textbooks. I turned to a large, newly updated food microbiology tome, and was disappointed to find only two brief paragraphs on sourdough, and not much more on yeasted breads. So it became a challenge to find the information, mostly borrowed from chapters on wine, beer, dairy, and other food fermentations that share something in common with sourdough. I was able to narrow down the gas producer to a Leuconostoc species. The tip-off was reading that almost 90% of spoiled doughs are caused by Leuconostoc mesenteroides or Leuconostoc dextranicum. When I started searching for more on the genus, I found Leuconostoc mesenteroides is considered the primary agent in the fermentation of an Indian steamed bread called idli. (Spoilage is a subjective thing from culture to culture.) After soaking grains for a day and then grinding them with water into a paste, there is a 15-24 hour fermentation during which the idli batter increases in volume by about one and one half to three times---the same as our wild day two growth. Leuconostocs are also occasional spoilage bacteria in wine making, "but they undergo little or no growth during the alcoholic fermentation and tend to die off because of competition from yeasts. Nevertheless, these bacteria are capable of abundant growth in the juice and, if yeast growth is delayed, they could grow and spoil the juice or cause stuck alcoholic fermentation." Many microorganisms produce characteristic aroma compounds, and so smell is also an important clue. I had previously described an unamended, all-white seed culture as smelling like sour milk with a hint of rotten cheese. Then I learned that some leuconostocs are added to dairy fermentations (such as cultured buttermilk, and cheeses like Gouda, Edam, blue cheese and havarti) for their carbon dioxide and aroma compounds. Together, these pieces all fit what we were seeing, and according to the chapter on fermented vegetables, leuconostocs are quite common in nature and found routinely on all kinds of produce and plant material. So, we can expect them to be present on grains and in flour. Knowing how bland a flour-water mixture starts out, and seeing how the microscopic picture becomes more subdued as the sourness increases, it was apparent that the shift in populations and activity are tied to changes in acidity. pH is a fundamental factor in microbial growth. Some like it neutral while others need more acidity or alkalinity, but each species has its own pH range. The reason that the starters had become quiet on day three was because the pH had fallen and the gas-producing bacteria were no longer growing. Even though I still wasn't sure what these bacteria were, it was clear that whenever the gas-producing one or ones grew, the starter would subsequently become still and take longer to finish---sometimes by several days. I reasoned that the best solution might simply be to keep them from growing. And since they stop growing as the pH drops, why not add an acidic ingredient to the mixture to lower the pH and inhibit them from the outset? It was May now and Evan Shack had entered the picture. Unaware that this was already a hot topic, he began posting to the message board seeking help after having just tried to make starter and getting the same result that we had. Evan was interested in learning the science behind it, and he and Pat were both eager to get to the bottom of the problem, so they volunteered to do some testing. Soon after we joined forces, Gary Wray contacted me and we invited him to join our little task team. With so many different recipes to choose from, it was clear that there are several approaches to making starter. But we needed to pick a direction to focus our problem-solving efforts. And because so many people on the message board were loyal fans of The Bread Baker's Apprentice, the group decided the goal would be to use that formula, altering it as little as possible, and make it proceed as described in the book. The fix should be simple, with ingredients readily available at home or in the average grocery store. Our choices for the acids were ascorbic (vitamin C), citric (sour salt), tartaric (cream of tartar), acetic (vinegar), lactic (yogurt), and mixed acids (fruit juices). For our first trial we chose ascorbic acid, because it is readily available in the vitamin supplement section, known to be beneficial, and widely accepted in bread-making. Pat and I used vitamin C tablets that we had on hand. We crushed them and mixed the powder with the flour and water on day one. And much to our amazement... it worked! No gassy bacteria, and we were both growing yeast on or before day four, where it had been taking about seven days. But I discovered a little problem with supplement pills, which is that some are buffered without being labeled as such. I was not getting the pH to drop in mine even though I kept adding more and more vitamin C. When I took a closer look at the bottle, I found two ingredients listed which together, formed a buffer system that was keeping me from reaching the pH I was aiming for. Pat's vitamin C was not buffered and her starter took off in only three days. Buffer problems aside, neither one of us enjoyed the task of crushing pills. And whirring them in a blender with the water only worked so-so. We also had no idea what the best dose would be. Gary and I both had ascorbic acid powder, so we did another experiment testing different doses ranging from 1/8 to over 1 teaspoon mixed with the 4.25 ounces of flour on day one. It was a fun experiment to do. With the jars lined up next to one another, they looked like perfect stair steps as the starters began to rise. It was easy to see which doses were most effective by how fast and how high the cultures rose. For me, the most active jars were the ones with 1/4 and 1/2 teaspoon of ascorbic acid powder. For Gary, the best results came from 1/2 and 3/4 teaspoon, and so we settled on 1/2 teaspoon as the recommended dose. While the ascorbic acid worked quite well, and may be the ingredient of choice for purists or professionals, the average person must go a little out of their way to find or mail-order it. So we decided to press on. All of the acids that we tried, inhibited the gassy bacteria effectively, but sour salt (sometimes found with canning supplies) was so strong that it was hard to measure the tiny amounts accurately. Cream of tartar (found in the spice section) was too weak, and required an impractical amount to effectively lower the pH. We dismissed lactic acid because we didn't want to deal with dairy or go to the trouble of draining yogurt for the whey. And vinegar was so highly inhibitory to yeast in the doses required to lower the pH, that it was no solution at all. That left fruit juices. I tested the pH of various juices and made a list for the group to try---apple cider, orange, lemon, grapefruit and pineapple juices seemed like the most suitable candidates based on wide availability. But whenever trying a new juice or acid, I had the group run a negative control alongside---a duplicate to the test in every way, except using plain water. This would show whether changes in the result were due to the ingredients under evaluation, or to chance or variation in experimental conditions. Time after time though, the control jars followed the familiar pattern, while the test jars proceeded by the book. While the trials were under way I went back to basics, monitoring the changes in acidity and examining seed cultures under the microscope every day. I recorded pH readings, growth measurements and observations at the beginning and end of each 24-hour feeding cycle. After a number of runs, I gathered my notes to compare and look for patterns. (My pH paper was only sensitive to the nearest 0.5 increment, so readings are approximate.) I found that when I acidified the day one mix to 4.5, it stayed at 4.5 until I fed it again on day two. If I didn't add more acid at that time, the freshly fed starter would read 5 and the gassy bacteria grew on day two and followed the oh-so-familiar pattern. If I acidified the day one mix to 4, it stayed at 4 until I fed it on day two, after which it read 4.5. The gassy bacteria did not grow and the culture started producing its own acid as other lactic acid bacteria were increasing in activity. During the second 24 hours, the pH dropped to 3.5 and the starter tasted really sour. Yeast usually appeared the day after. When I acidified the day one mix to 3.5, I actually got some yeast growth on day two. I'm not sure that this is the best way to go, though. I've only done it once with citric acid and yeast were not as vigorous the next day as I had hoped to see them. More testing could be done. But the key points here are that the gassy bacteria grew at or above pH 5, not at or below 4.5, and the cultures I was growing all failed to produce acid of their own in the first 24 hours. That is important because a day one flour-water paste measures about 6---quite inviting to leuconostocs. And even more importantly, in all my trials I have never seen yeast before a starter gets sour, but it usually follows very soon after. 1. Doyle, Michael P., Larry R. Beuchat, and Thomas J. Montville. 2001. Food Microbiology Fundamentals and Frontiers, 2nd ed. American Society for Microbiology Press, Wahington, DC. This is great, I can't wait to read the rest of the story. I was thinking to myself that if we need an acidic environment to initiate a yeast culture, also favorable to the growth of lactobacilli, a yogurth-like environment already rich of active LAB would probably be optimal. I dissolved a teaspoon of yogurth in 30 grams of whole milk (uht directly from the fridge) and stirred in 18 grams of durum flour. After 12 hours it was much denser, so I refreshed with the same amount of milk and durum flour and after 12 more hours it raised. Today (the second day) I refreshed using 40 grams of sourdough, 18 grams of flour and 30 grams of milk and once again it has risen more that double in volume. I'm trying to reduce the initial density, as it grows very thick, probably due to the drop in PH/yogurtization? Tomorrow I'll use only 15 grams of flour and 30 of milk. Are there cons to this yogurth-like culture? Can it be subject to "rot" even in the fridge? There aren't any real cons to using yogurt that I know of, if that's what you have on hand. I don't think rot will be an issue. Yogurt works okay as an acid, although in side-by-side tests I didn't find it to work any better than pineapple juice, or orange juice, or ascorbic acid. I prefer to drain it and use just the whey, but adding more after the first or second day probably isn't really doing anything more for you. The yogurt lactobacilli won't survive the sourdough environment for long because they're more adapted to dairy culture. The cultures used to make yogurt are not the same ones found in sourdough starters. Just beware that leuconostocs also grow well in dairy, so it's too early to know what is raising your culture. Since you diluted the yogurt acid with milk, you probably raised the pH into the danger zone. In other words, diluting the acid defeats the purpose for using it as pH control. aaaah, I thought and hoped that the yogurth LAB would keep on proliferating and make my starter a nice yogurth/levain hybrid and that they would keep the acidity at the right level, but you tell me it's not the case. Actually this morning the thickness was decreased compared to yesterday, it looked less like a yogurth, but developed a more wine-like smell (probably due to yeasts?). I've had a strange (to me) happening. Over the last six months I've noticed a (posssible) decline in my sourdough seed starter. Slowly, it's ripeing levains (24 hour, 3 progressive builds) volume change more slowed, and its ripe levaining power too. Nonetheless, until recently I've been baking acceptable loaves. However, prior to late May I'd been experiencing slack doughs in 40% WW/60% bread flour SD loaves wherein 25% (Baker %age) of the WW was prefermented in the levain build. All of this occured before a late May vacation. Returning home (14 days elapsed between feeding) I fed my seed starter. I keep it in the refrigerator at 100% hydration and feed it 1:1:1 weekly. Since then: disaster. Since returning I have experienced exceptionally slack doughs. Formulae wherein I've previously experienced delightful results, mostly spread more than rise, either during final proofing or driven by oven spring. More importantly, my seed starter exhibited two distinctly different attributes. 1.) It had a different, distinctive odor--not offensive, but atypical--and 2.) it was "soupy": within a eight hours since feeding it had lost all its gluten net (I feed with first clear flour). My conclusion, after searching TFL extensively, my starter was contaminated with thiol compounds or an extraordinary bacteria. (I recently refreshed my supply of First Clear flour.) I tried to save my starter by repeated feedings, for five days, but, subjectively, its "soupiness" got worse. I gave up. I had a "store bought" starter stored in the refrigerator--about 1 year--which I activated. In the first 24 hours it responded textbook-wise--after the third eight hour feeding it doubled its volume in under four hours. I was activating it at 89*F in a proofing box. However, it had an unfamiliar odor. Alledgedly, it's "originally SF sourdough", and from a much touted source (TFL members accolades) so I dismissed the odor. After 48 hours (eight hour feeding) I made two "seed" starters. 50 grams each. One I fed with First Clear flour, the second a 50/50 mixture of AP/WW flours. After 24 hour both exhibited no volume expansion despite the earlier aggressive expansion in the activated starter. Subsequently, I attempted to build a ripe levain with that seed developed with the First Clear fed initiation. (3 progressive feedings, 1:1:1). The result was "soup". Since then, about 8 hours ago, I built a 1:1:1 levain with the WW/AP seed starter, using 50/50 WW/AP: result, more "soup". I also made a mixture, 1:1) of the First Clear flour and water. After eight hours it exhibits the expected gluten net. I've retained both the First Clear and the WW/AP seed starters. I also have a reserve "store bought" starter in the refrigerator. I've read your post re thiol contamination, and, as stated above, I've tried to recover my failed three-year-old starter, without success--and, yes, maybe I didn't give it enough time. Whatever, I'm now at the point where I have two choices. 2. try to save one or both of the saved, soupy, new seed starters. Please: got any advice? For example; could/should I use pineapple juice to activate a "store bought" starter? I'm at my wits end. I don't have a viable starter, but I don't want to abandon Sourdough bread baking. P.S. I spoke too soon. The 100% hydration mixture of water, and the First Clear flour after twenty-four hours exhibits strong fermentation. It has the same odor as the initated new starter. I don't think my well is suddenly contaminated. Appears the flour contains a pretty tenacious bacteria. I know your frustration, as I've been there, but please don't abandon sourdough baking. A couple of separate issues to talk about, so let's start with the easy one. It sounds to me like the store bought SF sourdough is little more than fairy dust. I say that because it took off after 24 hours, smelled funky, and stopped rising after 48 hours. Sound familiar? What you activated was typical bacteria in the flour, rather than cultures in the dried starter. (This is why I don't like dried starters.) The cultures in the starter powder may not even be viable, but if they are, they will need to be activated separately from any fresh flour. I don't know at what stage of ripeness the original starter was dried---hopefully very ripe with a low pH, because that would help in the reactivation process. If it were me, I would ignore the instructions that came with the starter to revive it on fresh flour every eight hours. Instead, I would mix the powder with liquid only (equal parts), and let it sit for at least 24 hours before adding any flour. This is one of the few times when (canned) pineapple juice could help. Then, if it takes off soon after adding fresh flour, you'll know you've got a viable culture. And if so, you can start feeding 3 times a day. On your previous starter, you say that after feeding for 5 days, you gave up. Does that mean you threw it out? If so, I won't go into detail on how to save it, just say that 5 days wasn't enough time. If you've read about my experiences with the thiol issues, and those of others here, it generally takes 10 days or so to turn it around. But I recommend feeding only with white bread flour, at least until you have a healthy starter again. I think that first clear and whole grains are too high in ash for your previous feeding routine and were probably compounding your problems. From your P.S. it sounds like yeast finally activated in one of the new starters for you, no? Now we just need to figure out a new feeding routine to get and keep it in good shape. Is it stringy, sticky, or otherwise abnormal-looking at this point? First, I don't want to give up sourdough baking. The last two years has been a great learning for me. However, of late, results have been less successful, and despite small, corrective actions (ala TFL advice) things seemed to be getting worse. I think my previously reliable seed starter was going down hill, subtly, and gradually, since last November when an illness laid me low, and its feeding was neglected for seven weeks. Throughout its life I've been maintaining this starter with First Clear flour since its initiation two years ago with consistent and satisfactory performance, until recently. Only when I refreshed it from the new bag of First Clear flour did it fail entirely. This is the starter I gave up on after five days, when it no longer displayed any levaining power, and turned runny after each eight hour interval of feeding--unfortunately, fed with the same FC flour I finally understood was the probable source of the undesired contamination. I reasoned, perhaps wrongly, that this starter was beyond saving, and disposed of it. I still have two versions, about 75g each, of the newly initiated starter. One's last feeding was with the offending FC flour, the other was fed, at the same time, with a 50/50 mixture of WW/AP flour. Both feedings were 1:1:1, 5 days ago; both starters turned runny (the consistency of smooth crepe batter) within eight hours of feeding, exhibited identical odors, and showed no levaining activity. Both remnants are languishing in the refrigerator, with a thin layer of apparently hooch on their surfaces. My post-script to my original posting above reported that, as an afterthought, I simply mixed equal amounts of water and the offending First Clear flour, covered it and let it set on the counter. After twenty-four hours its initial gluten net was gone, the mixture was runny, showed a few gas bubbles and had the same odor as both the older starter and the two versions of the newly initiated starter. To me, the behaviour of the FC flour/water mixture was the definitive proof that the FC flour was the source of contamination. I've read your posting re thiols, but didn't think I was dealing with that problem. I wrote my original post when I concluded, perhaps wrongly, that the offending bacteria has dominated the newly initiated starters so strongly they too are beyond recovery. With waning hope I wrote you, TFL's resident expert, for advice. I also have some dried starter. It's been refrigerated, in a sealed, foil envelope, approaching three years. I've got the time (I'm retired), the motivation, and the desire to resurrect or start anew to, once again, have a viable seed starter. I created my first starter with "store bought" wet starter, followed the attending directions, and it served me faithfully for six months, before I purchased a dried starter, and initiated it, per the seller's directions, successfully. I discarded last week. So, with two sickly versions of newly initiated wet starter, and one aged dried starter (also purchased, same source) what would you advise me? Please, don't waste your time repeating anything you've written before. I think I've read everything you've posted, and have no trouble searching this wonderful website. Just point me in the right direction(s). I'll also have no difficulty trying more than one approach. of late, results have been less successful, and despite small, corrective actions (ala TFL advice) things seemed to be getting worse. Hi David, it sounds like it's time for more drastic measures :-) I find that starters are almost never beyond saving, even though 10 days may seem like a long time to invest. Some prefer to start over from scratch, and while you may be able to leaven bread with a baby starter in as little as 4-7 days from conception, it will take another 2 weeks of feeding to get it to a mature and stable state. So, it's not really time saved, and as you have found, it's no guarantee the starter will turn out any different/better. The first thing we need to determine is what kind of gluten issue we're dealing with---proteolysis, or thiol interference. You describe it as soupy/runny. Does that mean that after stirring, it drips freely off the spoon in individual drops and is easy to rinse off? Or does it appear to sag, slump or puddle, while clinging tenaciously to everything it touches? What is your objective---mild, sour, something in between? Are you devoted to first clear flour? runny: your first description--it drips freely off the spoon--is the best description. I would amplify it with two additional descriptors. 1.) initially it runs in a continuous stream from a spoon after stirring, reducing to individual drops only at the end of its run-off; and 2.) I developed the habit of rubbing spoons, bowls, tongs, containers--anything that has dough or starter clinging to it--with my fingers, under running water, reducing any lumps, or tenacious strings to gritty wet flour. I do this, hopefully, to prevent clogging the plumbing. (So far, I've been successful). All three starter versions I've worked with, after eight hours were batter-like. When I rub the stirring spoon, under running water, it is smooth--the batter is totally free of lumps or gluten strings, and clears from the spoon immediately. Although I rub it, from habit, it would likely rinse entirely in a few seconds with no assistance from my fingers. My goal: My wife and I are a bit like the Jack Spratts: I like sourdough that has a slight tang to its taste, not pickle sour, but noticeable; she likes it mild. What I've learned to do, in the past year is build levains that are mild: short time between feedings ~ 8 hours, and temperatures 70's to low 80's; or twelve to sixteen hours between builds, and higher temperatures 89°F to 92°F for lightly sour levains. 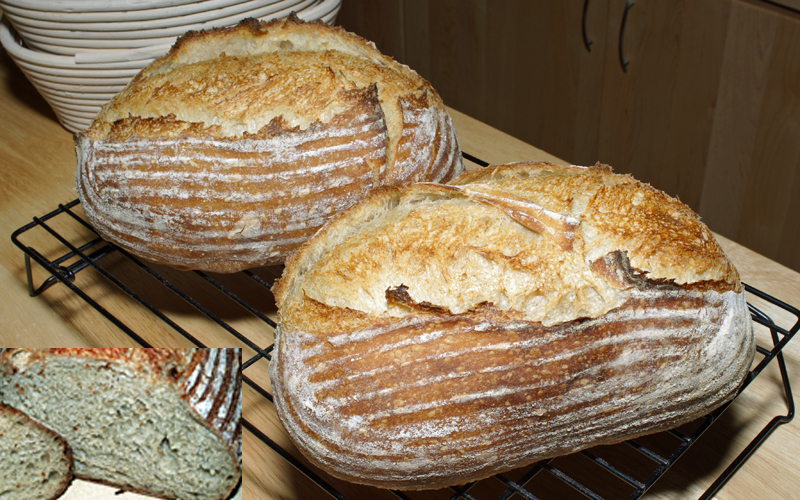 I also vary the amount of flour prefermented in the levain builds between 20% to 35%. Mostly, I bake mild sourdoughs, but occasionally indulge myself. My goal is to replace my lost seed starter with one that will respond similarly. Debra, I'll refresh a good starter with shavings from inside used sneakers if that's what it takes. I'm not wedded to using any particular flour type. I began using First Clear flour based on a suggestion I read somewhere online. In the beginning of this journey I was so obsessed with sourdough I spent hours reading everything from fairy tales to doctoral dissertations I could find on the web. If it used the word "sourdough" I read it (at least I tried to; despite my own physical sciences background, the technical language defeated me in some of the cases.) Using FC flour has served me well for two years, seemingly failing when my feeding interval discipline wavered, and ending with my most recent batch of First Clear flour. Hope this adds more useful information. David, yes, very useful. What you describe is proteolysis, like what I wrote in part 2 about my starters liquefying the day before yeast appeared for me. The proteolytic enzymes are in the flours, and they are being activated by low pH. Have you tasted your starters before refreshing? I'm betting they are probably pretty sour if they are liquefying so quickly. The first clear and ww flours are exacerbating the problem in two ways. First, they have much more of the problematic enzyme than white bread flour. And second, the higher ash content supports more bacterial growth and acid production. The high temperatures also encourage more bacterial growth and acid production at the expense of yeast growth and leavening power. So, your starters are caught in a vicious cycle right now. Debra, I'll refresh a good starter with shavings from inside used sneakers if that's what it takes. :-))) Fortunately, I don't think that will be necessary. To break the cycle and turn things around, you will need to rein in the bacteria and keep them in check. You don't have to abandon the high extraction flours, but it sure would make things easier. Also, low to mid 70's for the temperature. Beyond flour, temperature and hydration, tell me more about how you normally feed it for maintenance. You mentioned 1:1:1 above---is that once a day? Twice? Every 8 hours? Is it rising at all when you feed it now? Routinely, I've kept my healthy starters in the refrigerator, at 100% hydration, feeding them every seven to ten days. I've developed good discipline with that routine, wavering up to two weeks only a couple of times until last autumn when I was bed-ridden. Early on, I tried feeding daily, maintaining my starters at room temperature. That quickly became tedious, and a major detractor from the fun of learning sourdough. Although retired, I lead an active, and varied life style--tending a newborne, daily, is not in the cards. I also found building levains progressively, with eight or twelve hour intervals between feeding over twenty-four to thirty-six hours, while controlling the temperature with a proofing box, gave me vigorous levains, tweaked for the targeted bread style, and desired flavors. When initiating the new starter I added 100g each of flour (FC) and water to the 30g of dried starter/flour mixture. I adjusted the water temperature to achieve a beginning temperature of 89°F, and had pre-heated the proofing box to 89 °F. This prcedure followed the supplier's directions in spirit (cup of flour, 1/2 cup water, 85°F, feed every eight hours). I chose the slightly higher temperature as optimum to favor bacterial growth, and acid production. After 24 hours it was expanding vigorously every four hours. I'd stir it (to keep it in the quart canning jar) watch it double again in four hours, and feed 100g of starter with 100g each of flour and water every eight hours throughout day 2, but reduced the temperature after 24 hours to 76°F--this the nominal ambient temperature in my kitchen (+/- 1°F) during summer months. Nonetheless, I kept it in the proofing box for all of day 2, continuing to feed 100g of retained starter 1:1:1 every eight hours. It continued to double every four to five hours. I'd noticed the unrecognizable smell early on day 1, it continued with slight increasing intensity through day 2. I've searched my memory for an analog to the smell to help describe it; I can't find one. Its "close-but-no-cigar analog is "phenolic", but less acrid. On day three I moved its container to the kitchen counter. First feeding on day 3 I noticed it hadn't expanded as much overnight, the odor was the same, and when I stirred it down it was runnier, but still contained slight threadiness. However, it never rose again. I feed it twice more on day 3. Between the feeding intervals the mix turned completely runny, the smell persisted, and no expansion occured. On day 4 I feed it once in the morning, after eight hours it had turned runny, had the now familiar smell, and hadn't expanded. Also, on day 4 a mixed an additional 50g of runny starter with an equal amount of AP/WW flour and water, and put it in the proofing box at 76°F. After eight hours both starters were runny, had the now familiar smell, and hadn't expanded. Also, on the day before I initiated the new starter I'd fed 100g of my old starter 1:1:1 using FC flour, and placed it on the kitchen counter. I fed it every eight hours, and noticed it expansion was reduced, after each feeding. Overnight it barely expanded and was also runny. I think it was at that time I decided to activate the refrigerated, dried starter I had in reseve. I continued to feed it, along with the new starter for the next four days, it just seemed to get deader and deader. I discarded it on its fifth day, and put what hope remained on the new starter. I've not tasted the starters. On day 4 I knew I was in trouble, but didn't know what. I put the two versions of the new starter in the refrigerator after a final feeding, and began searching TFL, and the Internet in general. I reviewed your postings on thiols, and Part 1 of the Pineapple Juice Solution (yesterday, I reviewed Part 2). I'd read those three postings in times past with intellectual interest, but, "They don't apply to me," David had thought, smugly. After my search I was still uncertain, probably feeling overwhelmed by the density of information. The problem descriptions seemed to fit loosely, but not entirely. Moreover, the intensity and rapidity of what was happening to my starters didn't seem to fit. In retrospect, the fit is closer than I thought. At that point, no longer smug, I wrote for your help. "They don't apply to me,"
"They don't apply to me," David had thought, smugly. :-) Isn't it humbling? I wish I could see and get a whiff of your starter, because I'd recognize leuconostocs in a second. Depending on what type of flour they're growing on, the smell could be anything from sour milk/rotten cheese to spackling paste or window cement. And when grown at high temperatures, there can be other smells. From your account of what you've done with these new starters, and the unfamiliar smell, I think that's probably all it is. You would recognize the smell of yeast, and the starters would be expanding if that were growing. Since your starters have liquified, I think they have reached the third phase. And that's a good thing, because it means you're close to activating yeast, and then it will all turn around for you. How about taking one out of the refrigerator and giving it a 2:1:1 feeding with whole wheat flour? Let that sit for 24 hours, or until it expands and peaks, whichever comes first. There's no point in worrying about the maintenance routine until it is fully up and running. I'll do what you said first thing in the morning. Well, I think we've finally dug to the bottom of the problem. Simply put, it's not starter yet. And it never was (but it should be soon). What you are really doing is making sourdough from scratch with flour and water, because for whatever reason, the dried culture did not activate for you. The process seemed to be stalled because all the feeding had been holding it back. It gets some traction on the pH, as evidenced by liquifaction, only to be set back when feeding flushes out too much of the acid. Which is why in this case, the answer is to feed less, not more; although that will change once yeast start growing, and I think that will happen very soon. I'm writing this thinking I, perhaps, misunderstood the feeding ratio convention. Regardless, I mixed 100g of WW flour with 50g each of water and starter (@ 100% Hyd.) forming a ball of stiff dough. Left it covered at room temperature. Throughout the day the ball sagged into what now resembles the Portobello mushroom cap. There is a scattering of bubbles viewed through the bottom of the container--approximately 2 per sq. cm., the largest the size of a pinhead. If there has been any expansion of the starter it is only slight. The spackle-paste-like odor is dimished, now coexisting with the smell of WW dough fermenting; both, however, are subtle. Just stirred the mixture. I tried to knead it, but it has no gluten structure at all; reminds me of mixing epoxy putty. I pulled it together into a domed mass, but in less than 15 minutes it spread evenly across the container's bottom. I intentionally ensured all the bubbles on the bottom were collapsed. I'll keep a close eye on it throughout the day. The starter remains as described above, except for its odors have diminished further, and there are a few tiny bubbles formed on the bottom. The largest is pinpoint size, and their distribution is scant. Obviously, I don't know what's generating them, but there is something live in there. I'm motivated to keep going. I just checked the starter again. In the past 1-1/2 hours there's been expansion. The density of bubbles on the bottom is greater. It doesn't appear to have peaked yet. When it does, what feeding protocol do you recommend? pH (or something that correlates with it) is to these sourdough yeast as temperature is to a furnace. When the temperature drops to a certain point, a thermostat switches the furnace on, and then it will start blowing warm air. When the pH drops to a certain point, dormant yeast activate (which is like turning their switch from off to on), and then they can germinate and begin to metabolize and produce CO2. The acid tolerant heterofermentative lactobacilli are what take the pH that final distance so that yeast can activate. Feeding flushes away the acid and moves the pH in the wrong direction, which is why you didn't feed it this morning. Feeding less or not at all seems counterintuitive I know, but you have yeast growing now, where it stubbornly refused when you were feeding more. No need to wait until morning to feed it. Go ahead and give a modest 1:1:1 feeding with the flour you'll be maintaining this starter on, just before you turn in tonight. It's okay if it hasn't peaked yet, since it isn't too big a refreshment. And if that peaks before I get back here tomorrow, you can feed it again in the morning. Sound like a plan? Fed last night approximately 9:30 PM 1:1:1 using whole wheat flour. Looked like it had peaked sometime during the night. Gluten structure remained, but very relaxed. Fed again 7:30 AM 2:1:1 per your earlier instructions, with bread flour, which will be its maintenance flour. Thinking about what you said re an acidic enviornment effect on yeast, and being a "belt and suspenders" kind of guy, and curious, I also fed yesterday's remnants, which had languished on the counter overnight, 1:1:1 using bread flour. The latter's only for fun though; my attention is on the first. I will feed it 1:1:1 when it peaks. 8:30 AM: observable expansion: volume now about 1.3 x original volume, no offensive odor. In fact, there's hardly any odor. The gluten will stop liquifying now that your starter is up and running, so long as it isn't neglected or given enough time to get overly acidic. The pH increases over several days and normalizes as the yeast population grows and strikes a balance with the bacteria, and the bacterial populations will change as the pH comes into the range that supports the most desirable ones. Smaller feedings more frequently increase the yeast:bacteria ratio more effectively than larger feedings less frequently. So 2:1:1 is ideal if you're up to feeding it every time it peaks, which could be as much as every four hours throughout the day. Obviously it's not very practical as a long range maintenance routine, but for today, or any time you notice leavening power dropping off, it's a perfect way to flush out the negative effects of excessive acid and give the yeast a big boost. I sometimes do this the day leading up to mixing my levain or final dough, or anytime it seems sluggish. Whatever ratio you settle into should fit your feeding schedule. Feed enough that it doesn't get overly ripe before the next refreshment. If you decide that you only want to feed it twice a day, you'll probably need a bigger feeding than 1:1:1 (which is what I sometimes use for thrice daily feedings). Give other ratios a try, like 1:2:2, or even 1:3:3. After a point, you'll notice that leavening power drops off if feeding gets too big, because that can give the bacteria too much latitude. The point is, let your starter tell you what it needs and adjust accordingly. I recommend that you keep feeding it at room temperature for a couple of weeks before putting it into cold storage. That's when I notice my new starters undergo another transformation---they get noticeably more robust and fragrant. Why? I don't know, but I suspect that's when Lactobacillus sanfranciscensis appears. Let me know if any problems arise along the way. Can't fully express my gratitude. I'll feed it three times a day, for the next two weeks or more, but then it must go into fridge with feedings once a week thereafter. My travels, and other projects dictate. With a mature starter I've been maintenance feeding 1:1:1, allowing it to proof for 1 hour at room temperature--just enough to show volume expansion--and returning it to the refrigerator for another week. I bake sourdough loaves weekly. I usually timed a levain build (three progressive feedings, eight hour intervals) for the day after a weekly feeding. I did this because expansion continued, albeit more slowly, through it's first day in the cold. I reasoned, the second day the seed starter was likely in its best condition for building levain. I've maintained only 150g of seed starter. Every levain built has begun with 20g or less of seed starter (largest levains built have been 540g); I've never had a failure, although I think my old starter was out of balance, and going down hill slowly these last six months. I'll follow your advice if I see levaining power dropping off. Do you have any suggestions for "optimally" feeding a refrigerator stored seed starter? Do you think I'm keeping enough mass? Make more levain than needed, say at least 20g more, feed the excess 20g my usual 1:1:1 resulting in 60g, and use it to entirely replace my previously stored starter, rather than feeding the remnants seperately. I've got no problem with that, except when I build levains with flours (Rye, WW, etc.) other than just the bread flour I plan to use for maintenance. On those occasions I'll just refresh the stored starter as I do now. Do I have it right? P.S. edit: Read your Pineapple #2 comment suggested. I'd never read it before, nor consciously thought about the distinction between starter storage, and starter maintenance. Yet another lesson. Thanks, once again. Make more levain than needed, say at least 20g more, feed the excess 20g my usual 1:1:1 resulting in 60g, and use it to entirely replace my previously stored starter, rather than feeding the remnants seperately. If you need to refresh and keep the leftover, just be sure and give it at least one full refreshment cycle at room temperature before feeding again and putting it back. Alternatively (and maybe a better option), you could feed the rye or ww levain an extra time, with bread flour to convert it back, and keep that. 1:1:1 twice with bread flour will eliminate 8/9 of the previous flour---and that's no more work than feeding the remnants one extra time. It's up to you, really. I just know that once you get the desirable cultures in tip-top shape after feeding a couple weeks at room temp, you're going to want to safeguard them as much as possible. Does it make more sense now, thinking in terms of storage, maintenance and natural selection? I meant what I said in the other thread; you have a gift for communicating. When someone asks you the time, you reply "8:36"; you don't tell them how a clock works. It probably sounds a little weird, but I'm happy I had this problem. "1:1:1 twice with bread flour will eliminate 8/9 of the previous flour-"
It's not clear to me the reasoning behind the above cited assertion. When a starter is fed 1:1:1, 1/3 of it is mature starter (and 2/3 are fresh flour + water). If done one more time, you'll end up with 1/3 of the previous 1/3, or 1/9 (1/3 x 1/3 = 1/9). This also holds true for the flour in it if old and new are the same hydration. In David's case, I think it generally is. If you only have 1/9 of what you started with, then 8/9 are replaced with whatever you've fed since then. Make sense? And if fed a third time, as in a 3-build scenario, it would reduce to 1/27 of the starting flour (1/3 x 1/3 x 1/3). See how it works? The flour dilutes out pretty quickly, even though the active microbes regenerate. I have a curiosity: is S. Cerevisiae generally present in a pure sourdough culture? Someone says there is, someone else says that it's not present because the environment is too acidic for it. Copyright © 2002, American Society for Microbiology. All Rights Reserved. Acetic acid (167 mM) and lactic acid (548 mM) completely inhibited growth of Saccharomyces cerevisiae both in minimal medium and in media which contained supplements, such as yeast extract, corn steep powder, or a mixture of amino acids. However, the yeast grew when the pH of the medium containing acetic acid or lactic acid was adjusted to 4.5, even though the medium still contained the undissociated form of either acid at a concentration of 102 mM. The results indicated that the buffer pair formed when the pH was adjusted to 4.5 stabilized the pH of the medium by sequestering protons and by lessening the negative impact of the pH drop on yeast growth, and it also decreased the difference between the extracellular and intracellular pH values ( pH), the driving force for the intracellular accumulation of acid. Increasing the undissociated acetic acid concentration at pH 4.5 to 163 mM by raising the concentration of the total acid to 267 mM did not increase inhibition. It is suggested that this may be the direct result of decreased acidification of the cytosol because of the intracellular buffering by the buffer pair formed from the acid already accumulated. At a concentration of 102 mM undissociated acetic acid, the yeast grew to higher cell density at pH 3.0 than at pH 4.5, suggesting that it is the total concentration of acetic acid (104 mM at pH 3.0 and 167 mM at pH 4.5) that determines the extent of growth inhibition, not the concentration of undissociated acid alone. I continue to see 1:1:1 as the recommended refreshment rate for a stable, well maintained starter, but I guess I don't fully appreciate why. Even when a starter is being refreshed at room temperature the pH of the mature starter is generally between 3.8 and 3.6. If the LAB growth is constrained by pH (Gänzle; http://aem.asm.org/cgi/reprint/64/7/2616) and yeast growth is limited by available carbohydrates (Saunders; http://www.aaccnet.org/cerealchemistry/backissues/1972/chem49_86.pdf ), a 1:1:1 refreshment will push the pH of the newly mixed starter up to perhaps 4.4, just slightly above the point where the growth rate of the LAB is the same as or less than that of the yeast. From that point on, the LAB growth continues to slow down as the pH falls while the yeast goes on it's merry way unaffected by pH. The pH drops to 3.8 where the LAB stops reproducing but continues to metabolize maltose and produce acid. When the pH reaches 3.6 the LAB essentially stops, leaving the yeast to multiply until they deplete the usable carbohdrates. 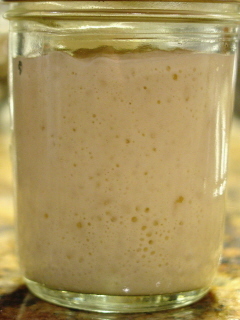 If this process is repeated on a continuing basis, it seems to me that the ratio of LAB to yeast will tend to decrease until it reaches a new point of stability (different from what it will be if the refreshments are larger) so the post-refreshment pH becomes an important control on the balance between LAB and yeast. If you go the other way, and refresh at 1:10:10 on a continuing basis, the growth rate of the LAB is greater than the yeast for quite some time - up to the point where the pH drops below 4.3 - and the ratio of LAB to yeast goes up over a number of refreshments to reach a new point of stability at a (substantially) higher LAB density. If I want a sour loaf I need enough LAB to produce the necessary acid so I think I want a starter that has a high concentration of LAB, so that leads me to want to refresh at 1:10:10 or some other number that puts the post-refreshment pH well above 4.3 and keeps it there long enough to grow lots of LAB. What is it I don't understand? The LAB growth will never be constrained by pH if you're feeding to keep leavening strong. We're not letting them go until pH becomes the limiting factor, because the proper refreshment point is set by the yeast growth cycle rather than the LAB cycle. The yeast cycle stops first. If you consistently let it go to 3.6, the desirable LAB will fade away and be replaced by less flavorful, albeit more acid-tolerant varieties. And the yeast will probably suffer. That's one of the differences between growing selected cultures for relativley brief periods in a laboratory, and growing mixed cultures of fortuitous microorganisms continuously in a less controlled setting. Mother Nature gets involved. Things are seldom as simple as laboratory data make them seem, because the studies are designed to isolate and look at one or a limited number of factors on one organism at a time. With working starters in real life, there are many factors in play, not just the ones you're looking at. 1:1:1 is popular, no doubt, because it is easy to remember, easy to calculate, easy to mix... and it works to keep leavening strong and everything in balance if you're feeding 3 times a day. But I think there are just as many here who prefer larger refreshments twice a day, or other hydrations. I myself, keep one at 125% and one at 60%. When someone has a preference, I try and work with that because there isn't just one best way. My prescription here was custom tailored for David as a starting point (we have to start somewhere, right?). It was about coordinating the refreshment rate with feeding frequency and other factors to help him get back on track from the problems he was having. If you prefer 1:10:10, and it works for you, that's great :-) It will give you a higher LAB:yeast ratio, but beware that your leavening power could suffer at such a high feeding rate. What is the mechanism by which the yeast cycle stops first? There must be something I still don't understand about these living things. I can't find a set of conditions under which the yeast runs out of nutrients before the LAB has produced enough acid to drop the pH to 3.8 or below and thus stop reproducing. And that is reflected in all of my data which show that the pH reaches 3.8 well before the starter dome starts to flatten out (which I interpret as the sign that the yeast growth rate is declining). At every temperature (between 2°C and 41°C) the LAB growth rate is greater than the yeast growth rate, and this seems to hold for a variety of LAB species in addition to our lactobacillus sanfranciscensis. Add to this the constraint that the yeast stops growing when (and slows down well before) it has consumed the 1.7% (of flour weight) that is usable sugars and glucofructans while the LAB is always going to shut down for low pH well before it consumes the 5+% of the hydrated flour that is maltose. It seems to me that if the yeast is going to stop first, there has to be some negative coupling between the yeast and the LAB (other than pH, which is not really a coupling since all of the acid comes from the LAB) that reduces the LAB growth rate enough to allow the yeast to gain a growth rate advantage. There is some LAB sensitivity to ethanol, but not enough under real dough conditions to significantly inhibit the LAB; and in the other direction if the LAB is producing significant amounts of acetic acid it is a real drag on the yeast growth rate, but again under starter growth conditions this should not be a big concern. I can't find a set of conditions under which the yeast runs out of nutrients before the LAB has produced enough acid to drop the pH to 3.8 or below and thus stop reproducing. Unless the flour is deficient in enzyme activity, the limiting factor for yeast is generally the buildup of inhibiting substances before depletion of resources. LAB growth has a suppressing effect on yeast, so rising power tends to be stronger when LAB are kept in check. As LAB are reined in, not only do yeast tend to flourish, but pH comes up as well. Note that pH is only a measure of H+ concentration, not an indicator of starter ripeness or quality. pH at maturity is different from starter to starter, depending on temperature and how each is maintained, so it is not the most reliable yardstick for an artisan baker. And that is reflected in all of my data which show that the pH reaches 3.8 well before the starter dome starts to flatten out (which I interpret as the sign that the yeast growth rate is declining). Your starter reaches 3.8 because you maintain it with very large feeds; and more generations favor bacterial growth, slowing yeast. Understand that your pH data are for your starter only, and will not match what would be measured for other starters with different protocols. Thought it time to give you an update. All the loaves were baked identically, and exhibited the same amount of oven spring. The crumb too is essentially identical among the three that have been consumed. The flavor is excellent, although the first loaf, made with levain built from discard was noticeably more sour. Here's a shot of the last two baked. 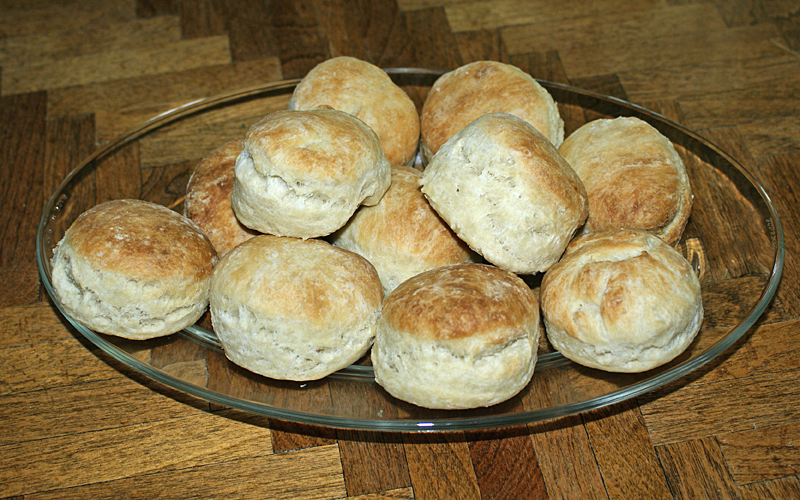 The cut biscuits were proofed for 2-1/2 hours (76°F). They didn't expand much, but were puffy. The oven spring, on the other hand, is obvious. These are the best yet, lighter than any of the previous. I don't know if that's a result of the new starter, or that I made the butter/lard and flour mixture finer this time, resulting in less of the a layering seen in the earlier tries. Obviously, I'm delighted with the new starter. Gosh David, those buscuits sure look good. I didn't know the sourdough variety could be so fluffy. The loaves look awfully darn nice too. The first one turning out more sour could have been because the starter was new---the yeast population increases over the first 7-10 days or so after it activates, which shifts the LAB:yeast ratio, and the LAB populations change over as well to other more desirable varieties. But more likely, it's because of the temperature difference. When you do everything cold that way at the front end, it inhibits the bacteria from getting started and thwarts acid production. Good or bad depending on the effect you're going for. Now that you have a nice healthy starter, how does it smell? Fragrant, I'm sure. Its performance at this stage is your new reference point, and whenever it seems to be veering off course, you know what to do. Just return to a more intensive feeding routine at room temperature until it bounces back. Going forward (with such a great starter :-) you may decide you like the milder breads that your wife prefers. But if you want to make more sour breads, look for formulas done entirely warm, or at least start out warm with the retarding done later in the process. Here are some other factors to play with, broken down one at a time. There are basically five that I can think of that you have control over to one degree or another, and so these are the tools you have to work with. All other things being equal, each one represents a spectrum from more mild on the left, to more sour on the right because of how these factors influence the yeast:LAB ratio over multiple refreshments. You can't maximize both at the same time because one comes at the expense of the other, but you can find a happy compromise somewhere in there. All of these factors influence the outcome to one degree or another. One, two, or more can be tweaked to enhance each other (but you can go too far), or to correct for one or more that are working against you. The last one---specifically refreshing earlier, while the dome is at the highest point, but before it gets bumpy and starts to flatten---is helpful for flushing acid out more quickly and giving yeast a leg up, however, you need to let the final build ripen before incorporating it into your dough, or the dough will be very slow to rise. I look forward to seeing many more of your breads. What a great summary! I've been practicing (and playing a little) with all the variables the past two weeks, but I'm still only at the threshold of understanding this new starter. Nonetheless, thanks to your help, we're off to great relationship. There is very little odor; what little I encounter is usually in the first few seconds I uncover a levain build. At the beginning its light and floral, at the end of a build there is a slight "bite" in my nose when I inhale. Another thing I'm delighted with: the levains gluten network stays strong. At the end of each build the strands are long, elastic and cling to the spoon I stir with. About the time my old starter went south, I was experimenting with 50/50 Bread/WW loaves, prefermenting 28% of the total flour (all WW) in the levain build. I fell in love with the flavors, which I attribute mostly to the prefermented WW, but no matter what I tried the dough was very slack. The best loaves came with extensive machine kneading. I've just refreshed 30g of the refrigerator-stored seed starter, with its second 2:1:1 feeding. It is at room temperature, and I started it six hours ago. I forgot to mention earlier, this starter, at 76°F--we keep the house' AC set, and I monitor room temperature with an accurate thermometer--peaks at six to six-and-a-half hours regardless of the feeding ratio. While I was feeding it during its two-week maturation stint I kept good records, trying feedings from 2:1:1 to 1:2:2; across that span it regularly peaked tightly in the aforementioned range. Consequently, although I started out planning to refresh at eight hour intervals, when I could--and that occured more often than not--I fed when it peaked. Tomorrow, I'm going to use this seed starter to build a levain for a 50/50 Bread/WW flour dough. Got any suggestions on how much of the preferment can be WW? If I retard the dough the levain will contain 14% of the total flour. If I use my non-retarded formula the levain will contain 28% of the total flour. My goal is to make a 50/50 B/WW dough that exhibits nearly the same strength, and all of the oven spring, I'm realizing with 45/45/10 AP/Bread/Whole Rye (the loaves above). I'm still open to any and all suggestions, however, waking this morning I decided on an approach to developing a "go to" 50/50 White/WW loaf formula and specific techniques. I'm going to start with an all white levain (bread flour). The first levain build of three was mixed an hour ago. The ripe levain will be ready early tomorrow morning, when I will mix, manipulate and ferment the dough without retarding. Following, about every other week I'll make the same bread moving in steps toward a levain made with 100% WW, and overnight retarding the dough. I'll adjust the flour weights with each variation to keep the total flour 50/50. So sorry I haven't responded until now---not sure how I've missed it for so long. After all this time, you probably have it figured out and perfected, but I'd love to hear how it's going on your quest. Were you able to achieve the goal? If you're still having problems, I may be able to offer a few suggestions. You will be pleased to know that, the starter you helped me nurture to maturity is still going strong. Following your suggestion to replace it every week to ten days with fresh levain, I can report I've not once failed to do that, and for more than year I've been getting wonderful consistency in the three breads I bake routinely: sourdough--two varieties, white with 10% whole rye, and 50% whole wheat, baguettes--three varieties: straight dough, 8 to 12 hour poolish, and natural levain, and sourdough foccacias. My starter never fails me; and I never fail, each bake, to remember your kind, detailed help and support when I was struggling. Truth is, while I still bake our daily bread every week to ten days, and still make three or four wines each year, my creative urges have moved on to yet another food passion: charcuterie. In September I attended a class at the John C. Campbell Folk School wherein we collected a fresh whole pig from a local butcher and, during the ensuing week, converted it to brine-cured ham, fresh Italian sausage, pate de campagne and liver pate, tessa--an Italian bacon, morta della with pastacios, head cheese, lardo, and three or four other creations with wonderful, unpronouncible Italian names and mouth-watering flavors. We finished on Friday preparing the second ham proscuitto-style. It will cure in the instructor's cellar, for about sixteen months, and ultimately be returned to the Folk School and sampled by his next "Whole Pig" class. I'm converting one of my wine chillers--previously converted to a lager beer fermenting container--to a dry-curing chamber by adding a humidifier and humidity controller. I already smoke brine-cured meat, fish and fowl; next steps are cold-smoked and/or dry-cured sausages. At the moment my wife and I, with the help and guidance of a local handyman, are updating our kitchen with a 36" dual-fuel, six-burner stove, and a vortex-shedding range hood. Those are indeed beautiful loaves. But I must not understand how you do the build. You say that your took "12g of the stored starter and, using a modified levain building schedule (2:1:1, 2:1:1, 1:1:1) built 356g of levain". That sounds like the first build is 12+6+6=24g of starter; the second build is then 24+12+12=48g of starter; the third build becomes 48+48+48=144g of starter, which is off by a factor of 2.5 from the 356g of levain. So I think that there must have been another step somewhere. the answer got posted below. Great graphic! It really separates out the major variables. In this case, it is not so much that the yeast benefits from the low ash flour but that the total acidity (as measured by TTA) is increased by the buffering capacity of the high ash flour which allows the LAB to continue to churn out acid until the pH drops below 3.6 or so which happens later in a whole grain culture. The yeast is relatively insensitive to pH so the yeast growth is almost totally independent of the LAB population and the TTA that it yields. This is clearly true if the threshold for "Warm" is above 24°C since between 2°C and 24°C the growth rates for yeast and LAB are very close to each other with LAB having a small but insignificant advantage everywhere. Between 28°C and 32*C the yeast growth rate is declining while the LAB growth rate is still going up and the acidity will peak well before the yeast population begins to plateau. At this point the LAB just make acid or go dormant depending on the specifics while the yeast make as much progress as the temperature will allow. This I don't understand. Is there something about the higher hydration starters that dilutes the acid enough to encourage additional LAB growth? The pH certainly doesn't respond to an increase in H2O concentration. Or maybe the LAB being much smaller are not as mobile in a highly viscous/drier environment (that argument doesn't make any sense to me either). Your insights and hypotheses about why this works will hopefully turn on the light. Again, while observation supports this conclusion, my explanation would be that smaller refreshments result in a lower post-refreshment pH and thus disables LAB growth sooner after the refreshment while the yeast just eats and multiplies when given more glucose, fructose, and compatible glucofructans. So the left extreme is not so much a benefit to the yeast as it is a detriment to the LAB while the larger/less frequent end of the spectrum is more of an equal opportunity case for both yeast and LAB. The left end of this trade is an area where I have no data (so I will go there and observe) but if the process is being run at temperatures above 27°C it should not make any difference as the LAB will peak well before the yeast reaches maximum numerical density growth rate and under those conditions the yeast is always playing catch-up. It seems that in general there is weak coupling between the yeast and LAB growth rates, and the stability of a culture depends mostly on the lack of competition for sugars, acid tolerance of the yeast(s), and net positive gains on a per-generation basis for the dominant species relative to all of the competitor constituents that come with the flour used for the refreshment (for reasons that may be unique to each culture). So one result is that you can mistreat a culture for quite some time before it goes south on you (in fact it can go on for a long time before you even detect that there is something threatening the good guys - and by then it may be too late, though your magic methods seem able to recover some pretty badly mistreated cases). My advice is to not dwell on the absolute values of laboratory data collected under a controlled set of conditions. Those aren't going to help much here. It's never that simple with living things, because they interact with each other and their environment in dynamic ways, adjusting and readjusting to multiple factors as they go along. Shift your focus instead to the relationships---learn to think in relative terms instead of absolute. The yeast is relatively insensitive to pH so the yeast growth is almost totally independent of the LAB population and the TTA that it yields. Yeast are relatively insensitive to pH in the normal ranges encountered in sourdough, but their growth isn't unaffected by the LAB population. between 2°C and 24°C the growth rates for yeast and LAB are very close to each other with LAB having a small but insignificant advantage everywhere. This isn't about absolute growth rates. It's about relative growth rates, and how they affect the ratio of LAB to yeast over multiple refreshments (when consistently fed at "ripe"). Yeasts have a lower minimum water activity than LAB (meaning they can grow in drier conditions). Again, it's about relative growth rates, and how they change with conditions. This is about the influence that the number of generations has on growth kinetics. LAB have the longer lag phase which gives yeast a head start, but they reproduce faster than yeast once they take off. So extending the logarithmic phase gives them an advantage. And conversely, reducing log phase stops them short giving yeast a boost in the ratio. the LAB will peak well before the yeast reaches maximum numerical density growth rate and under those conditions the yeast is always playing catch-up. It simply has to do with where each population is in its growth cycle at refreshment. Yeast enters stationary phase first, often when LAB are just hitting their stride. I didn't check my notes, and doing it from memory I got the bread levain build mixed up with the biscuit build. What I've posted is wrong. This time I checked my notes. Bread levain build: 12g of seed starter refreshed 1:1:1 progressively, every 8 hours, 3x; (((12x3)x3)x3) = 324g. I needed 250g for the bread dough, which left 74g of ripe levain to replace my seed starter. I used 20g refreshed 1:1:1 and tucked it into the refrigerator last Saturday, replacing my seed starter. I just started doing this following Debra Winks guidance. This levain build was done last, Friday-Saturday, dough mixed and retarded Saturday-Sunday, and loaves baked Sunday. Bicuit levain: Monday evening I took 89g from the discard bucket and refreshed it twice with a 6 hour interval between two, 2:1:1 feedings; ((89x2)x2) =356g. Tuesday I mixed and baked the biscuit. I'd been refreshing my new seed starter every 6 to 8 hours, at room temperature, and keeping the discard. Since the discard was a mix spanning ten to three days old, I built the levain warm, wet, fed lightly and often to favor yeast development, thinking the discard's sourness might be more than I wanted. Again, these are things I've learned only recently, guided by Ms. Wink. Thanks for catching my senior moment. I glad I don't get that sloppy when I bake :-).